Whether in traditional paintings, effigies, or modern art, these two are always presented shoulder-to-shoulder, gaunt and ghoulish, in exactly the same robes but reversed in colour from each other. 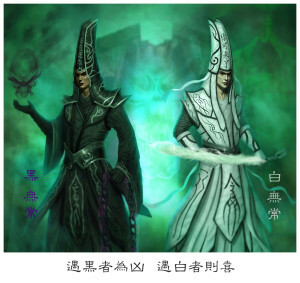 Hei (black) Wu Chang dressed in black and Bai (white) Wu Chang in white. Sometimes the details in their robes would compliment each other perfectly, white highlights on Hei’s robes and black ones on Bai’s. They would also be wearing tall hats with spell tags at the front. Sometimes one of them is portrayed with an extraordinary long tongue hanging out of his mouth. According to popular legend, the Hei Bai Wu Chang were once a pair of very close friends, Xie Bi An and Fan Wu She. Xie was tall, pale and slim and Fan was short, dark and stocky. One day the friends were walking near the river, when it started to rain, Fan urged Xie to stay under the bridge and keep out of the rain while he went home to fetch an umbrella. On his way back to Xie, the rain got heavier and heavier, lightening flashed, and thunder struck, turning the rain into a huge storm. But Fan went on, determined to keep his word. The river burst its banks, sweeping the small figure of Fan under and drowning him in its waves. After the storm, Xie beheld the corpse of his friend and was heart-broken, wishing that he was the one who died instead. He could stand his grief no longer and hanged himself from a beam of the bridge. When souls of Fan and Xie travelled to the underworld, the lord of this realm, Yen Wang, heard their story, and was moved. He dubbed Fan Hei Wu Chang, and Xie Bai Wu Chang and assigned them to work under the Cheng Huang, the city god. Their task is to catch the wandering souls of the wicked and bring them to justice in the underworld. 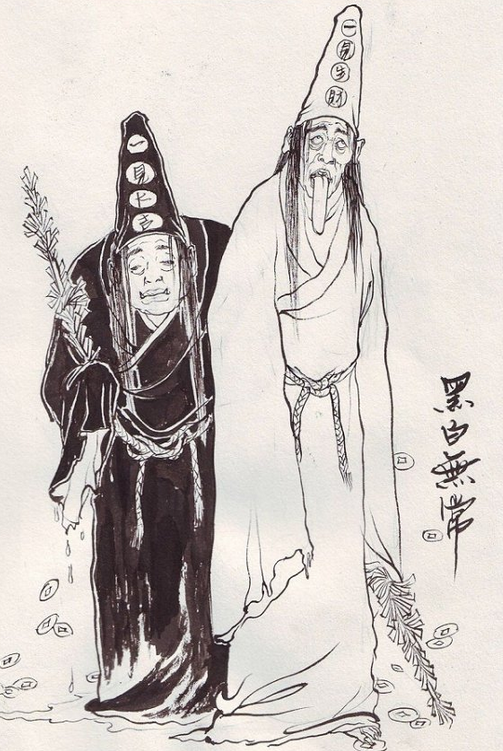 Through the ages, folklore has defined the image of the Hei Bai Wu Chang in pop culture by accentuating the characteristics of the once-living persons, evening out their height to give them both the stature that befits grim reapers of the damned, to symbolize the complete harmony between them and eternal reunion of these two friends. Hei Wu Chang is often seen carrying chains and handcuffs that seem to have replaced the ferule some modern versions. The spell tag on his hat, 天下太平(Peace Under Heaven) is a testimony to his prowess as a hunter of fallen souls, his terrifying appearance is supposed to scare any wrong doers into submission at the mere sight of him. Bai Wu Chang is sometimes seen wearing a smile, his long tongue hanging out due to his sad death by strangulation, carrying the umbrella that Hei was fetching for him when he drowned. His spell tag “一见生财”(Instant Fortune Upon Sight), reflects the good luck the Wu Chang bring to an area by ridding it of mischief-making evil souls. Today, hundreds of domestic MMORPGs and mobile games in China feature reinterpretations of the Hei Bai Wu Chang, also a favourite with artists, graphic designers and cosplayers alike. They have been depicted as well built warrior-wizards, pairs of effete, handsome Wuxia heroes, cute little demon hunters in SD form and because of the closeness that defines them, even as a couple. What I love about these two is the dichotomy between their forbidding and ghostly exterior, and the beneficial service they perform to the world of the living. The task of capturing fallen souls is unfortunately, a never-ending one. Today, the Chinese still invoke the aid of these ghoulish helpers. Or perhaps their sad story of ever-lasting friendship have kept generation after generation moved. Or may be their iconic image works so well aesthetically that they are just so fun to draw and cosplay. So amongst other things, I hope you find inspiration here for some new plushie patterns, or a Halloween costume for this year, that is a little different. In the meantime, enjoy these wonderful images.